We deliver anywhere in the United States. Self storage at your site gives you the added convenience of having your materials at hand on your own property. The portable self storage containers we offer in Minnesota, Wisconsin, and Illinois can be securely locked, keeping people and rodents out. FAST – We can usually deliver within 1 to 2 days from time of order. For more on how we deliver, view our FAQ page. STRONG – All steel ocean cargo containers are clean, dry and weather resistant, protecting your contents from damage. These containers are also insect and rodent proof and nearly airtight once closed. You can store the container at your site. We can move your loaded storage container from one site to another, or we can store your container between locations until you are ready for it. Looking for temporary self storage in Minnesota and other midwestern states? 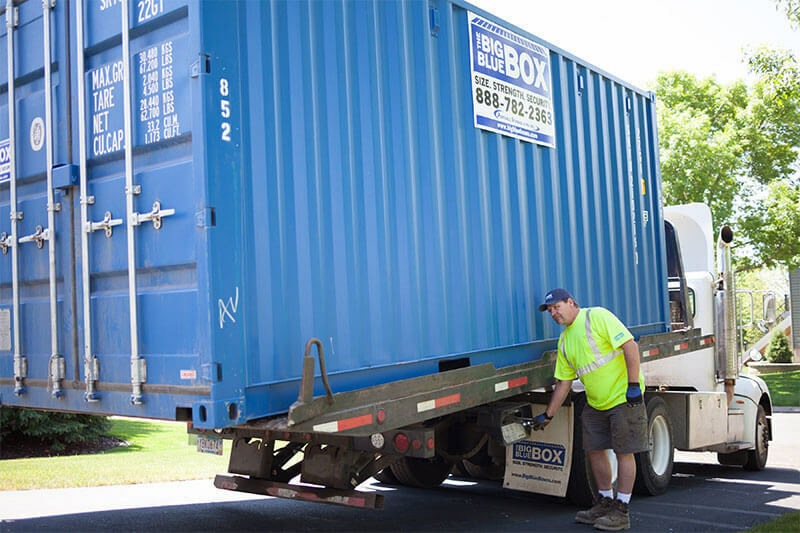 Big Blues Boxes will bring the storage container to you and you’ll fill it. Then, when you’re ready, we’ll pick it up and store at our facility. You can get to your belongings by simply calling the office. Contact us today to receive a quote and get started.